This year Ramadan falls in the long hot summer months for most of the Muslim world. Here are some great Ramadan tips on what to eat at Suhoor/Sehri to reduce thirst during these long fasts. Thank you to all my amazing facebook Urdu Mom followers for sharing their wisdom! A tried and tested tip is to have cardamom seeds with water at Suhoor/Sehri. You can add the cardamom seeds to boiling water and drink the warm water or let it cool to room temperature. The seeds can be substituted with water also if you have that at hand. Eat yogurt right at the end followed by a glass of water. This is one of the tried and tested Ramadan tips. Coconut water is a natural sports drink due to its high electrolyte content. Pick the one in its purest form avoiding the ones with a lot of preservatives. Barley Sattu daily at Sehri/Suhoor quenches thirst, cools the body, and gives instant energy. Mix Jame Shereen or Rooh Afza in a glass of milk and have that at Suhoor/Sehri. Read Surat Kausar three times after eating Suhoor/Sehri. Ice cold lassi (blend yogurt with sugar + salt and lots of ice ) for dinner the night before. Drink as much water as you can, including fruits and veggies that have a high water content at Suhoor and Iftar. Tukhum malanga (basil seeds), known for its cooling properties, in yougurt at Sehri. 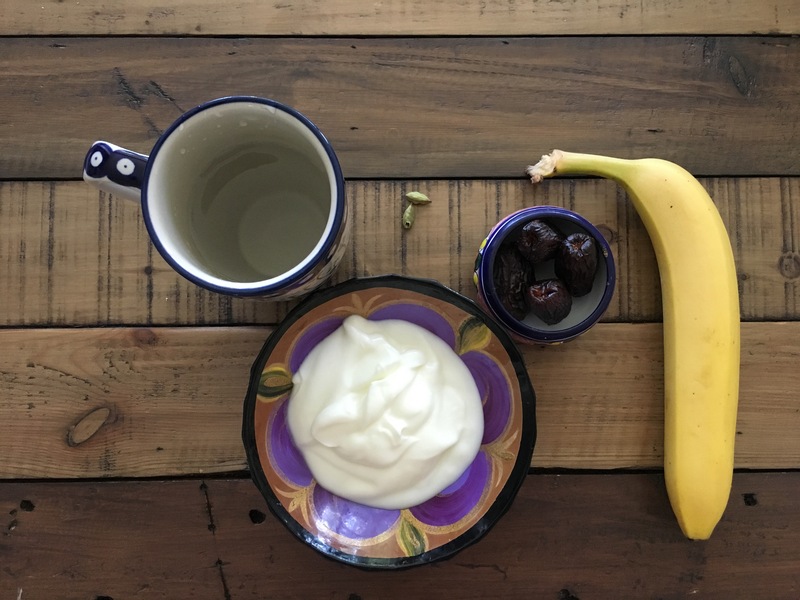 Yogurt + Dates is a great Ramadan tip to reduce thirst. 70% yogurt + 30% milk + sugar (optional) + ice. Shake well and drink in Sehri! Chia seeds soaked in water for a couple of minutes. They hold the liquid like a gel in the stomach and are quite effective. Khajoor in any odd number and a glass of milk at Sehri. Add chia seeds in water/milk/juice and drink it. Take 1/3 cup yogurt + 2/3 cup milk and mix together. Add honey or golden syrup and a pinch of salt. Add 2-3 tbsp oats. Mix, cover and let sit in fridge overnight. You can add fruit or nuts if you like, but it is perfect on its own and delicious and creamy too. It will keep you full for hours and just take water alongside for Sehri. Drink Nabees which is a Sunnat of the Prophet (PBUH): Soak 7 dates in water at nite. Grind with the same water in Suhoor/Sehri and drink it. Soak a few dates in milk overnight, blend with banana and almonds (and some yogurt if you like). This is full of energy and keeps thirst away. Hope these Ramadan tips helped! Let me know if you have any tried and test tip. Always love hearing from you. So many fantastic tips in one place! Thanks for sharing these Tamania!